Your heart is a muscular pump that has four chambers and four valves. 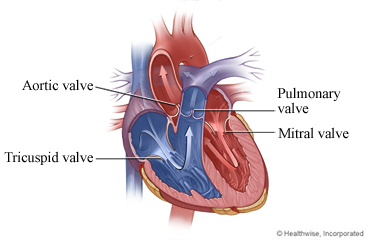 The four valves are the mitral, aortic, tricuspid, and pulmonary valves. The valves open and close to keep blood flowing in the proper direction through your heart. When something is wrong with one of the valves, the blood cannot flow in and out of the heart properly. Problems with the heart valves can cause leaks (valve regurgitation) and blockages (valve stenosis). You can be born with heart valve disease, or it can develop over a number of years. Mild cases of heart valve disease may not cause problems, but more serious cases will weaken the heart and can lead to heart failure. Treatment with medicine can help relieve symptoms, but it will not fix the valve. You may need to have the valve replaced or repaired. Eat a heart-healthy diet. For example, eat more fruits, vegetables, fish, lean meats, whole grains, and other high-fibre foods. Limit sodium, sugar, and alcohol. Be active. Ask your doctor what type and level of exercise is safe for you. Walking is a good choice. You also may want to swim, bike, or do other activities. Do not smoke. Smoking can cause more heart problems. If you need help quitting, talk to your doctor about stop-smoking programs and medicines. These can increase your chances of quitting for good. Avoid colds and flu. Get a pneumococcal vaccine shot. If you have had one before, ask your doctor if you need another dose. Get a flu vaccine every year. Take care of your teeth and gums. Get regular dental checkups. Good dental health is important because bacteria can spread from infected teeth and gums to the heart valves. If you have an artificial valve, you may need to take antibiotics before you have certain dental or surgical procedures. Enter L495 in the search box to learn more about "Heart Valve Disease: Care Instructions".